Keywords: Savanna soil; compaction; irrigation; morphological characters. Se estudió el efecto de la compactación del suelo en el desarrollo de la raíz de plantas de soya (Glycine max L. Merrill cv. San Baiba) sometidas a diferentes tratamientos de frecuencias de riego, porosidad aerífera y tensión cortante de un suelo franco arenoso de sabana. La soya es de importancia agrícola en la zona, donde el suelo es incompresible y de fácil deformación. Los objetivos fueron determinar (a) el efecto del contenido de humedad y porosidad aerífera sobre la longitud, el volumen radical y la masa fresca radical, y (b) la relación del contenido aerífero, tensión cortante y tensión normal con el crecimiento radical. Se utilizó el método Proctor, triaxial, medidores de humedad, frecuencia de riego y cilindros plásticos de 30 cm x 30 cm x 1.5 cm. Se emplearon bloques al azar en arreglo factorial simple con cuatro niveles de compactación por capa (0, 12, 24, 36) y cuatro de humedad a través de cuatro frecuencias de riego (todos los días, interdiario, cada dos días y cada tres días). Entre los resultados: (a) la longitud radical entre 24 cm y 79.5 cm; (b) el volumen radical entre 2 cm3 y 40 cm3; (c) la masa fresca radical entre 7.58 g y 34.04 g, con tendencia de los valores mayores para los tratamientos con frecuencias de riego diaria e interdiaria que produjeron resultados promedios por encima de la gran media (52.31 cm) de la longitud radical para los efectos de los cuatro niveles de compactación. Se concluyó que el sistema radical fue más positivamente influenciado por la humedad que por los efectos de las otras variables estudiadas. Palabras clave: Suelos de sabana; compactación; riego; caracteres morfológicos. Compaction approaches soil particles, dry or wet, reducing the air space and the soil ability to adequately preserve enough amounts of air. The soil pore space needed to ensure the gas exchange required by a healthy root system should be between 10% and 20% of air. According to Kozlowski (1985) and Costello, MacDonald & Jacobs (1991), the roots work best with a level above 10% oxygen, levels below 4%-5% highly inhibit root growth. The soil structure is changed by compaction, reducing size and pore continuity, causing increased soil density. It is conceived that the soil compaction, usually measured by evaluation of the dry density, creates root growth inhibition of plants, such as in soybeans which is agriculturally important for the area. It has been considered that compaction increases the soil resistance. According to Ponder (2004), the mechanism that compacted soil supported better growth more than not compacted is not completely understood. Much of the better growth is likely owing to better soil physical changes that caused better soil moisture conditions for growth. Severely compacted layer below the depth of tillage is a special problem of soil compaction in many farmlands. This severely compacted layer restricts root growth and water available for plant roots. Taylor & Burnett (1964) and Taylor (1974) reported on the excessive strength of plow pans when were dry; dryness was the main restriction hindering root growth, due that soil resistance diminished with rain or irrigation. The soil resistance critical value, at which plant roots do not elongate, is produced by soil moisture and stages of plant development. Comparison of the measures of compaction in the literature is quite difficult because of a lack of information on moisture and development status. Compaction, by definition, is the reduction of air-filled pores of the soil. It is common to provide the soil bulk density measurements unreferenced with the values of moisture content of the soil. Miller, Scott & Hazard (1996), and Cochran & Brock (1985) reported existing ample evidence supporting the reduction in growth caused by soil compaction, it has not always produced negative growth effects. Gomez, Powers, Singer & Horwath (2002) specified that the effect of compaction varied with the texture and soil moisture. These authors also reported that compaction reduced the growth of young ponderosa pine in California on fine textured soils attributable to increased soil strength, but soil compaction increased growth on a sandy textured soil owing to increased water holding capacity. Rahman, Hara & Hoque (2005) conducted a greenhouse experiment, with sandy loam andisols soil, to evaluate the cause of different levels of compaction on soybean. Root dry weight, root shoot ratio and shoot dry weight decreased significantly with the increased energy levels and decreased with increased levels of compaction. Hossne et al. 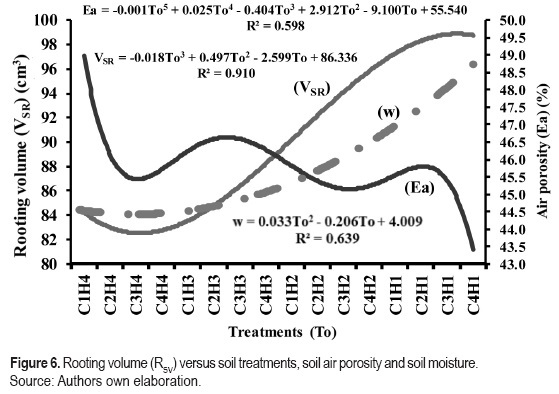 (2003); Hossne (2008) showed that soil bulk densities varied inversely with soil water content and that soil shear stress was an inverse function of soil moisture, close to zero as it approached the soil liquid limit. Hossne (2004) reported that the action of root growth increased its axial stress for soil shear stress with a critical value of 2343.2 kPa for 20.78% soil moisture content, these soils exerted a shear strength is lower 500 kPa within the range of field capacity. Smucker & Erickson (1987) informed that plants subject to soil compaction are more susceptible to water stress. And according to Schumacher & Smucker (1984), root development may be damaged by lack of oxygen in compacted soils. The objectives of this study were to evaluate: (a) The influence of moisture content and air porosity levels of a sandy loam soil of savanna on the length, volume and fresh root mass of soybean; and (b) the relationship among soybean root growth and air porosity, shear strength and normal stress of the studied soil. A greenhouse cultivation of Soybeans (Glycine max L. Merrill cv. 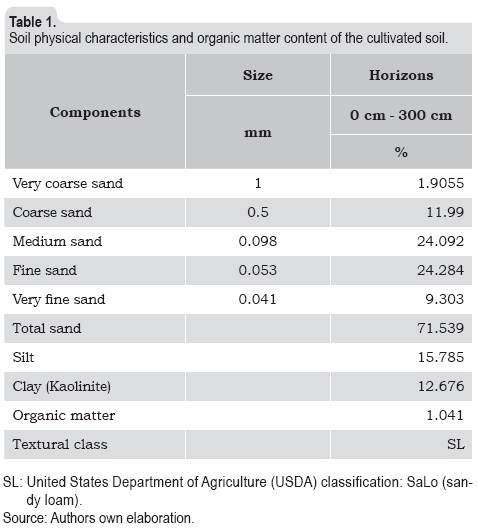 San Baiba) in sandy loam soil of savanna of the Monagas state, with the characteristics shown in table 1, was used in the study. The Proctor method was used to determine the dry bulk density. The Proctor test is a geotechnical engineering test to find out the maximum density that may be practically achieved for a soil or similar substance. The Proctor soil compaction test is done by measuring the density, or dry unit weight of the soil being tested at different moisture content points. The aim of the soil test is usually to determine the optimum moisture content for the soil. In addition to soils, other substances, such as aggregate, gravel, or sand, may be measured. In this scenario, compacting the soil means increasing its density by forcing air out of the soil. By compacting the soil or aggregate at different moisture contents, an engineer may determine what the optimum moisture content and compaction level are of the soil or aggregate for a specific use in a particular engineering project. The Proctor test was invented in 1933 by Ralph R. Proctor (1933). Both the original and the modified Proctor tests also allow the use of a larger mold for measuring substances that contain larger particles, such as gravel. The air porosity (Ea) was determined using Equation 1, as a function of the total porosity (n), the volumetric water content (θ), dry bulk density (ρS), particle density (ρP), gravimetric water content (w) and the water density (ρW). Moisture soil meters and frequencies of irrigation were employed. The interaction of four compaction levels (Proctor strokes) per layer: (0, 12, 24, 36) and four soil water content through irrigation frequencies: (daily, inter-day, every two days and every three days) were studied. For determination of soil strength, τ = C + σ* tan (φ), the triaxial apparatus was utilized. 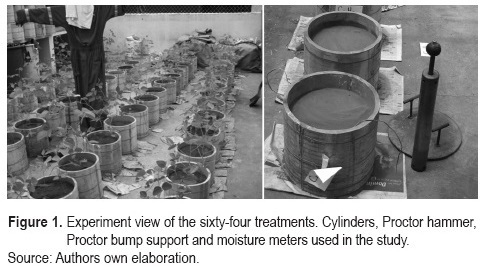 Sixty-four polymers cylinders 30 cm diameter, 30 cm height and 1.5 cm thick were employed, cut longitudinally into two halves at the center and fastened shown in figure 1. The harvest took place between seventy-two (72) and seventy-five (75) days. 24.57 kg (8.19 kg/layer) of soil per cylinder were utilized. Fertilizer application of 2.74 g/cylinder of 25 kg/ha-100 kg/ha-120 kg/ha of NPK was performed. One liter of water per irrigation frequency was applied. A randomized blocks experimental design (4•4) with simple factorial with sixteen (16) treatments (To) with four replications for a total of sixty-four (64) experimental units was applied. Irrigation were established: every day (Fr1), inter-day (Fr2), every two days (Fr3) and every three days (Fr4) and compaction levels: 0 drops/layer (C1), 12 drops/layer (C2), 24 drops/layer (C3) and 36 drops/layer (C4). Statistically regression analysis of variance (ANOVA), the least significant difference (LSD), the best subset regression method, and with multiple regressions it was introduced a cubic polynomial with the dependent variable root length (L) and the independent variables: compaction, represented by air porosity (Ea) and irrigation frequencies (Fr) were used. By applying multiple regression, a third degree polynomial with thirteen terms was optimized, of which the terms Fr, Ea•Fr, Ea2•Fr, Ea2•Fr2, Ea3•Fr, Ea3•Fr2 and Ea3•Fr3 were eliminated with p values greater than 0.05 in the ANOVA, to forge a third degree polynomial with six terms shown in equation 2, with R2 of 92.33, adjusted R2 of 87.21, standard error of 2.83 and absolute minimum error 1.56. The ANOVA p value of 0.0002 showed a statistically significant relationship between variables in a high level of significance. Figure 2 shows the response surface plot for the model of equation 2. Figure 3 shows the results of the root length, shear stress and air porosity versus treatments and soil moisture recorded during the process of soybean root growth. Figure 4 evidence the results of root length, porosity and moisture versus the experiment treatments. Figure 5 indicates the results of radical fresh weight, air porosity and moisture versus the treatments. Figure 6 graphically displays the results of the rooting volume, air porosity and moisture versus treatments. 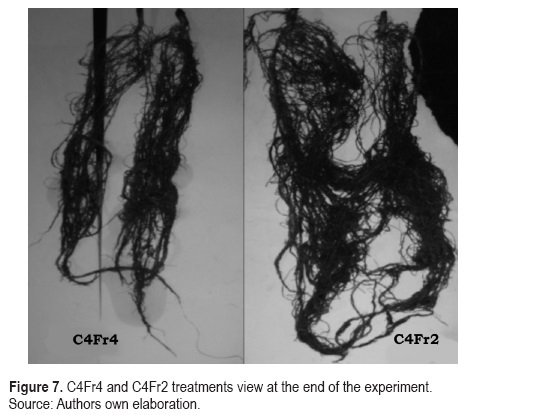 Figure 7 presents the root volume obtained with the treatments C4Fr4 (36 drops/layer with watering every three days) and C4Fr2 (36 drops/layer and inter-day watering). This supports the results presented in graphs and statistical analysis. According to Fageria, Balingar & Clark (2006), Grzesiak, Hura, Grzesiak & Pienkowski (1999), Iijima & Kono (1991), Masle (2002) and Yamauchi (1993) the inhibition of plant growth is attributed mainly to reduced rooting volume. Table 2 presents the statistical results obtained from the least significant difference analysis and analysis of variance. 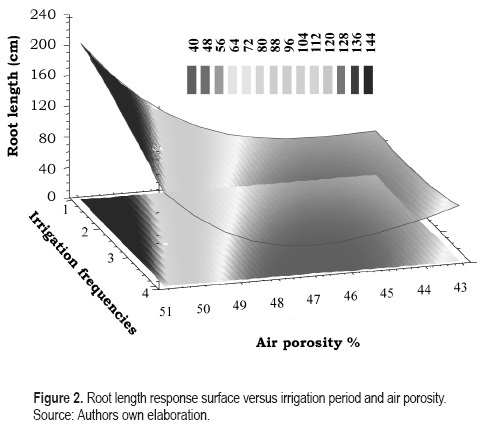 Root length versus irrigation period and air porosity, shown in response surface of figure 2, demonstrates that soil moisture was the variable almost influential for plant root development. The air porosity, with accepted percentage product of soil compacting effect, did not inhibited root growth, but fewer prevalent than water application as it is the intense blue shadow path seen adjacent to the irrigation frequency coordinate that exhibits the greatest root length assessments as noted in the palette values. Figure 3, that presents the curves of shear stress (τ) for different chamber pressures, shows that the resistance of the studied soil under satisfactory soil moisture conditions (Fr1 and Fr2), became imperceptible. In this analysis, the graphs for the results of fresh mass and root volume are not shown attributable to the same trends obtained. It is seen that soil moisture was the almost influential upon root growth. At the highest levels of resistance of the soil, the roots are more sensitive to water deficit (Davis, 1984). Figures 3, 4, 5, 6 and 7, show that the best root expansion of root length, fresh mass and root volume were for every day and inter-day irrigation periods, increasing with soil moisture increments. This coincides with the statistical results already presented. It is observed in table 2 that the longest root length was achieved with the daily watering frequency for compaction (C1) and maximum compaction (C4). There were seven treatment groups without significant difference; this was expected, since the four levels of compaction (C1, C2, C3 and C4) did not produce an effect on the two soil water content levels: inter-day and daily irrigation. Also, the use of both frequencies were indifferent one another. This indicates that moisture was the parameter that most influenced the root growth. Thereon; Ehlers, Köphe, Hesse & Böhm (1983) reported that mechanical impediments increased as dry bulk density increased and decreased by amplifying the water content. Similar results were reported by Blouin, Schmidt, Bulmer & Krzic (2004) and Coile (1948). According to Blackwell, Ward, Lefevre & Cowan (1985), and Boone, De Smet & van Loon (1985), soil wetness may produce an effect the rootability of pores smaller than the root diameter. It was observed that in compacted soil some roots were able to widen pore spaces by deforming the space with root expansion. Such deformation is easier for roots when soil is wet (low soil strength) than when it is dry (high soil strength). This was notified by Hossne (2004). 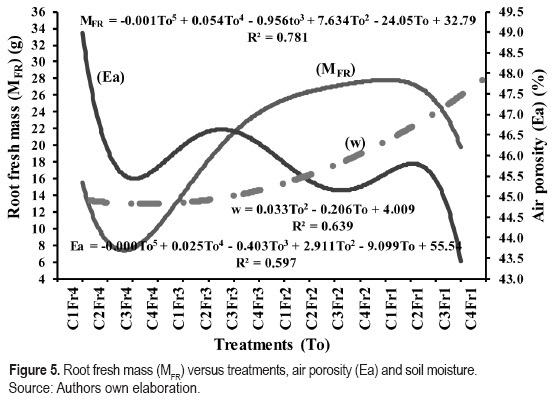 By using the best subsets regression analysis applied through the origin with independent variables moisture (w), dry bulk density (ρS) and treatment (To) as forced independent variables, and soil resistance (τ) and air porosity (Ea) as not enforced; the best models, in the order of influence, for root length (L) were w, ρS, To (R2 0.946) and w ρS To Ea (R2 0.949). This strengthens that soil water content was the crucial component that influenced root growth. According to Smucker & Erickson (1987) plants subject to compaction are more susceptible to water stress. Schumacher & Smucker (1984) specified that root development may be damaged by lack of oxygen in compacted soils. The lack of air porosity may cause harmful effects on plant growth (Drew, 1990; Grichko & Glick, 2001; He, Finlayson, Drew, Jordan & Morgan, 1996; Voorhees, Farrel & Larson, 1975 and Zou, Penfold, Sands, Misra & Hudson, 2001). When the proportion of oxygen diffusion decreases to 10% or less, it causes root injuries disabling its ability to function. Engelaar & Yoneyama (2000) and Beutler, Centurion & Da Silva (2005), found that the air porosity tightening was much larger than the field capacity, thus causing little restriction on soybean root development during the period; also, they found that the smallest value of penetrometer resistance caused reduction in soybean production was probably attributable to the large variation of soil water content during the cycle of soybeans. In this work the air porosity was much above 10%. These results are supported by Blouin et al. (2004); Hossne et al. (2003); Hossne (2004). Soybean roots appear to grow in soil under conditions of low water stress (Boyer, Johnson & Saupe, 1980; Garay & Wilhelmy 1983; Sivakumar, Taylor & Shaw, 1977). Taylor, Roberson & Parker (1967) established relationships between soil strength, water content, the emergence of seedlings and root growth. These studies indicated that the growth of plants and roots were reduced when soil resistance reached critical levels consequential to natural or provoked compaction, concluding that the resistance should be considered as a main factor of impact. 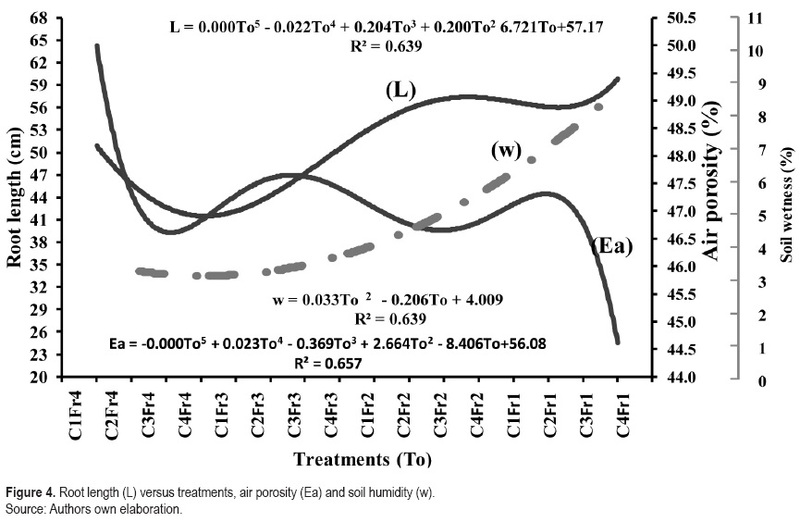 In this experiment for the studied soil, strength (τ) in humid conditions near field capacity was not influential. Compaction may affect the rate of elongation of roots. Taylor & Ratliff (1969) showed that an increased penetration resistance of 1.9 MPa decreased the speed of peanut root elongation to 50% of the maximum rate (2.7 mm per hour) through loose loamy sand. The same reduction was noted for cotton root with only an increased resistance of 0.72 MPa. Using spring wheat, Collis-George & Yoganathan (1985) showed that increasing shear strength of a fine sand seed bed from 19 kPa to 52 kPa reduced seminal root elongation from 43.5 cm to 0.2 cm per day. The limiting root strengths at low densities were achieved when the soil remained in a state of dryness. At 2.96 MPa no penetration occurred, caused by low water content or apparent density. According to Carter (1989) and Salter & Goode (1967) water stress was the most important soil factor limiting agricultural production in the world. Savanna sandy soils large pores contain kaolinitic clays that are considered inexpansible but suitable farm machine processes. In this regard, Goldsmith, Silva & Fischenich (2001) reported that sandy soils have large continuous pore, clays have small pores that transmit water slowly. Clays, however, contain more pore space than sandy soils. For growing plants, pore sizes are more important than total pore space. Therefore, plants will have a better environment in sandy soils if porosity is reduced because of the increase in water retention. The converse is true for clays. High porosity clays have a high macro movement that provides high infiltration and more water available for plants. Consequently, the plants will have a better environment in sandy soils if the porosity is decreased, then increasing moisture retention. According to Kim (2000) roots survive and grow where the water needed is available, temperatures are warm, and oxygen is present. The ability of primary root tips to enter, open and extend through the pores of the soil depends on the force generated by the root and penetration resistance. The atmosphere of the soil should contain an air space between 12% and 60%, oxygen content between 3% and 21% for root growth. Tokunaga (2006) concluded in his study that biomass production was greatest when water was readily available. In field work, where water availability may be very variable, when the compaction affects the availability of water may be more important than physical impediments. Using cotton planted in a fine sandy loam, Taylor & Gardner (1963) found that soil strength was critical in stopping root growth. They did not find a critical root limiting bulk density because root penetration at each bulk density was affected by soil water content. Root-limiting resistances were reached at lower bulk densities when soils were dry. 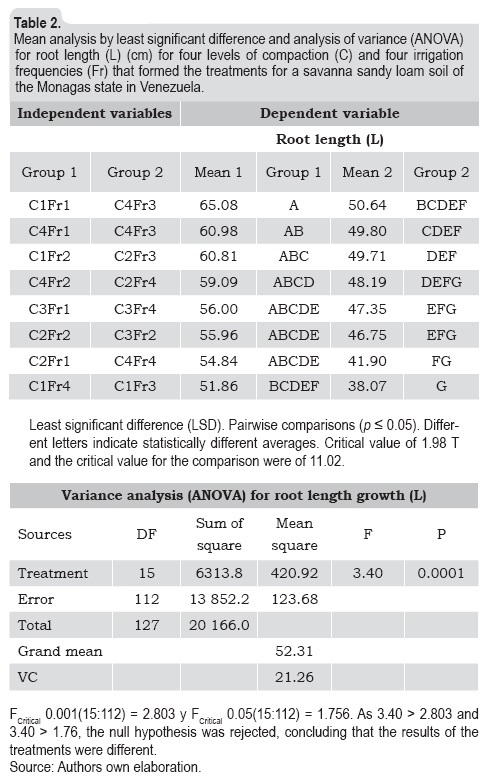 Higher strength decreased root growth rate. No penetration occurred at 2.96 MPa regardless caused by low water content or bulk density. The results were: (a) The root length varied between 24 cm and 79.5 cm; (b) The root volume between 2 cm3 and 40 cm3; (c) The radical fresh mass between 7.58 g and 34.04 g; (d) The soil rooted volume between of 83.0 cm3 99 cm3, with a tendency of higher values for treatments with daily and inter-day irrigation frequencies. For daily and inter-day irrigation frequencies, root length mean scores were above the grand mean (52.31 cm) for four levels of compaction. Root development was largely influenced by the soil moisture content. The consequence of the compaction attributable to the volume change caused by the Proctor hammer drops showed their influence, but possibly owing to reduced air availability and not favored by soil compaction. Soil resistance, that is an inverse function of the moisture, had no influence when applied irrigation frequencies that produced the greatest soil moisture. The root volume, root fresh weight and soil rooted volume conserved the tendency of higher values for treatments with daily and inter-day irrigation frequencies. The authors is grateful to the Research Council of the Universidad de Oriente in Venezuela for its support and funding for this research.